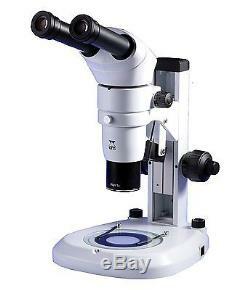 CETI VARI ZOOM 1.8 Binocular Stereo Zoom Microscope With Double Illumination LED. The CETI® Microscope range offers an extensive choice of affordable microscopes to suit all budgets. From basic educational needs to the more specialised requirements of the research and clinical scientist. The CETI range includes monocular, binocular or trinocular configurations to suit most typical applications and requirements. The Varizoom is a stereoscopic zoom microscope with parallel infinity optics and an optical zoom system. Three zoom ranges are available with a binocular configuration as standard. Optical Head: Binocular, inclined at 20°. Focusing: Zoom system with Rack and pinion system with safety stop. Stage: Broad base design, supplied with frosted and black/white contrast plates, 2 stage clips. Illumination (Variable): Episcopic: 5W LED with directional condensing lens Diascopic: 5W LED. "T he outer packaging may show some signs of wear and will have been opened for inspection however the item is new & unused". The item "CETI VARI ZOOM 1.8 Binocular Stereo Zoom Microscope Double Illumination LED" is in sale since Monday, March 06, 2017.